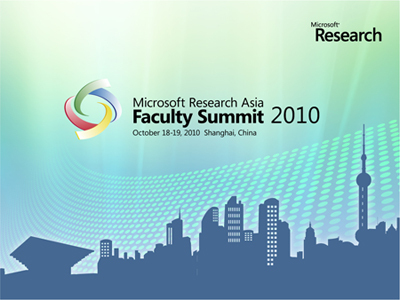 The Microsoft Research Asia Faculty Summit 2010 was held in Shanghai, China, October 18–19, 2010. The central theme of this year’s faculty summit was “Technological Trends and Future Talent.” The summit provided an opportunity for leading faculty from the Asia Pacific region to share views about how technological advances and computing trends can present new opportunities for research and development in computer science and other related disciplines. The Computing in the 21st Century Conference followed the summit on October 20. The faculty summit will highlight current technological trends, such as cloud-client computing, natural user interaction, and the challenges of large data and its visualization. The demand for training in these fields presents challenges as well as opportunities for developing new talent for the future. Presentations and discussions will focus on how technology is helping solve issues that society is facing and how to train the future talent to meet societal needs. Participants will have the opportunity to interact directly with visionaries working in these important technical areas and to communicate directly with researchers who are involved in some of the most exciting technologies. Cloud-Client Computing. The emergence of cloud computing is an active topic in research and the global industry. What is the impact on hardware advances, computing architectures, data centers, infrastructures, software applications, and intelligent search engines? How do these effects advance the whole ecosystem? How will the proliferations of mobile devices, especially sensor-enabled programmable devices, change the IT industry? Natural User Interaction. Emerging technologies will help users manage complexity and interact with computers more intuitively. Advances in vision and perception, gesture and other interaction modalities, real-time natural language processing, and integrative intelligence are leading to systems that anticipate user intent rather than just reacting. Challenges of Large Data. To embrace the sweeping changes affecting technical productivity, we will need innovative new platforms for environmental science, astronomy, and nearly every other discipline. Advanced new platforms and visualization tools are now essential for effectively and intelligently processing and analyzing the enormous amounts of data available to researchers. Talent Development. With the added complexity and advancements in multiple computing technologies and the increased need for diversified skills, talent development for future researchers has become more important. How can this talent be identified, trained, and inspired? What investments are needed at universities and in curriculums to respond to these changes and demands for future generations? How will the industry and academic communities respond to these challenges? During the Microsoft Research Asia Faculty Summit 2010 and the 12th annual Computing in the 21st Century Conference, mutually productive interaction with the Asia Pacific academic community took center stage. That sentiment was amplified across town Oct. 18-20 when Microsoft Research Asia hosted its Asia Faculty Summit 2010 and the 12th annual Computing in the 21st Century Conference. The events underscored the facility’s commitment to active, mutually supportive collaboration with academia. The faculty summit, held Oct. 18-19, offered leading faculty members from universities across the Asia Pacific region a chance to hear from some of the world’s most eminent computer scientists and to share views about the opportunities offered by current technological advances and computing trends. Many of those same faculty members also were on hand on Oct. 20 for the Computing in the 21st Century Conference, which drew almost 2,000 professors and students, from universities in Shanghai, Hangzhou, and adjacent areas, who gathered to gain exposure to the new horizons of computing. No fewer than three winners of the prestigious A.M. Turing Award, commonly referred to as the “Nobel Prize of computing,” participated in one or both of the events, including Barbara Liskov, institute professor at the Massachusetts Institute of Technology, the 2008 Turing recipient; John Hopcroft, IBM Professor of Engineering and Applied Mathematics at Cornell University, who won the award in 1986; and Chuck Thacker, a Microsoft technical fellow who works at Microsoft Research Silicon Valley and who in March was revealed as the winner of the 2009 honor. Attendees of the events learned about some of the areas in which cutting-edge research is being conducted today, much of it within Asia Pacific universities and research facilities. The Asia Faculty Summit and the Computing in the 21st Century Conference underscored opportunities for computer scientists, now and in the future, to play a role in solving society’s most challenging problems and to help determine how future generation will work, play, and communicate. Cloud-Client Computing: Topics discussed included the impact on hardware, computer architectures, data centers, infrastructure, software, and search—and how the entire ecosystem can be advanced. In addition, presenters explored how the advent of mobile devices will change the IT industry, particularly those devices that are sensor-enabled and programmable. Natural User Interaction: The future direction of computing will enable users to manage the complexity they encounter and to interact with computers in a more intuitive fashion. Systems soon will be able to anticipate user intent, rather than merely react, by means of technologies that provide advances in vision and perception, gesture and other new ways of interaction, natural language processing in real time, and integrative intelligence. The Challenges of Large Data: The current and coming onslaught of scientific data requires new platforms that will enhance many disciplines, including environmental science and astronomy. Effective, intelligent processing of this data bonanza will depend on advanced computing platforms and visualization tools. The Asia Faculty Summit featured presentations and discussions that addressed the means by which technology can help to solve societal issues, as well as ways in which future talent can be best trained to meet the needs of society. Attendees enjoyed a rare opportunity to interact directly with some of the world’s foremost experts in these areas and to communicate with researchers working on some of these intriguing technologies. Lolan Song, senior director of University Relations for Microsoft Research Asia, opened the event by welcoming the attendees and providing an overview of Microsoft Research Asia’s collaborative efforts with academics. Rick Rashid, Microsoft Research senior vice president, provided an update on his organization’s activities, and Thacker delivered a presentation entitled RARE: Rethinking Architectural Research and Education. The morning session concluded with a panel discussion on the Internet of Things, chaired by Zhao and featuring David Culler, professor and associate chair of the Computer Science Division within the Department of Electrical Engineering and Computer Sciences at the University of California, Berkeley; Guihai Chen of Nanjing University; Hideyuki Tokuda of Japan’s Keio University; and Catharine van Ingen, partner architect for the External Research division of Microsoft Research. The first of four presentations during the afternoon session on Oct. 18, Cloud Computing Paradigm Shift, was delivered by Enwei Xie, general manager of Microsoft China’s Greater China Region Developer Platform Evangelism group. A second Turing Award recipient, Hopcroft, followed with a presentation entitled Growing Talent, for which Baining Guo, assistant managing director of Microsoft Research Asia, served as session chair. That talk fell squarely into another of the Asia Faculty Summit’s focus areas, the increasing importance of talent development amid the complexity of multiple computing technologies and the need for diversified skills, which will require curriculum investments by universities to identify, train, and inspire this talent. A pair of esteemed Microsoft researchers delivered the day’s final presentations. Curtis Wong, principal researcher at Microsoft Research Redmond, discussed The WorldWide Telescope: Challenges and Opportunities with Visualizing a Universe of Big Data, along with Chenzhou Cui, chief information officer at the National Astronomical Observatories of the Chinese Academy of Sciences. And Wei-Ying Ma, assistant managing director of Microsoft Research Asia, talked on Empowering People with Knowledge: The Next Frontier for Web Search. The day concluded with a second panel discussion, entitled Fourth Paradigm—Exploring Trends and Talents for Data-Intensive Science, chaired by Tony Hey, corporate vice president of External Research and co-editor of the recent book The Fourth Paradigm: Data-Intensive Scientific Discovery. The panelists included Key-Sun Choi of the Korea Advanced Institute of Science and Technology; Jinpeng Huai of Beihang University; Jimmy Liu of Singapore’s Agency for Science, Technology and Research; and Junichi Tsujii of the University of Tokyo and the University of Manchester. Natural User Interaction: Chaired by Frank Soong of Microsoft Research Asia, and featuring participants Masataka Goto of the National Institute of Advanced Industrial Science and Technology, James Landay of the University of Washington, Chin-Yew Lin and Jian Sun of Microsoft Research Asia, and Stewart Tansley of External Research. Mobile Sensing: Co-chaired by Zhao and Jacky Shen, also of Microsoft Research Asia, this session included participants Guihai Chen, Hao-Hua Chu of National Taiwan University, Shen, and Tokuda. Finding, Keeping, and Nurturing Talent: The Key to Success: Co-chaired by Guo and Weiping Li of the University of Science and Technology of China, this session featured participants Sadaoki Furui of the Tokyo Institute of Technology, Mounir Hamdi of The Hong Kong University of Science and Technology, Hopcroft, Seung-won Hwang of the Pohang University of Science and Technology, Xiaoning Ling of the X-Gainian Foundation, HyunWook Park of the Korea Advanced Institute of Science and Technology, Lolan Song, and Xin Zou of Microsoft Research Asia. On the afternoon of Oct. 19, the faculty members attended a demo fair held at Microsoft’s Zizhu campus in Shanghai to explore and discuss 22 technology projects from Microsoft Research Asia, other Microsoft Research facilities, and a host of Asia Pacific academic partners. One of the biggest, most influential gatherings in computer-science education in the Asia Pacific region, the Computing in the 21st Century Conference, chaired by Zhao, was held for the second time in Shanghai, where the event occurred in 2001. This year’s conference featured the theme People, Computing and the Physical World. Those in attendance Oct. 20 at Shanghai Jiao Tong University—co-host of the conference, along with Microsoft Research Asia—heard about the connections between people and computing, the intricacies of the physical and cyber worlds, and the impact of cloud computing and sensor networking on people’s lives. Zhao notes how the conference has evolved over the last dozen years. Leading lights in computer science from China and around the world spoke during the event. All three of the aforementioned Turing winners appeared, and the intellectual firepower hardly stopped there. In addition to keynote addresses from Liskov, Thacker, and Hopcroft, the audience heard talks from Rashid; Culler; Mahadev Satyanarayanan, Carnegie Group Professor of Computer Science at Carnegie Mellon University; and Hsiao-Wuen Hon, managing director of Microsoft Research Asia. Guihai Chen is currently a professor and Ph.D. advisor at Nanjing University. He earned his B.S. degree in computer software from Nanjing University in 1984, his M.E. degree in computer applications from Southeast University in 1987, and his Ph.D. degree in computer science from the University of Hong Kong in 1997. Due to his academic achievements, he has been frequently invited as a visiting professor by foreign universities including Kyushu Institute of Technology, Japan; University of Queensland, Australia; and Wayne State University, United States. He has a wide range of research interests with a focus on sensor networks, peer-to-peer computing, high-performance computer architecture, and combinatorics. He has participated as chief investigator or co-investigator in many key state research projects, including National NSF projects, the National 863 Plan for High-Tech Research and Development, the National 973 Program for Grand Fundamental Research, and the National Climbing Plan for Science and Technology. Learn more. Key-Sun Choi is a full professor in the computer science department at KAIST and is currently acting as department head. He founded and directs the Semantic Web Research Center (SWRC) and Cognitive Informatics Lab. Previously, he founded and ran Korterm and Bank of Language Resources. Prior to joining KAIST, he was a researcher in NEC C&C Lab for Machine Translation. He holds a bachelor’s degree in mathematics from Seoul National University, and master’s and PhD degrees in computer science from KAIST. His areas of expertise are natural language processing, ontology and knowledge engineering, semantic web, intelligent interfaces, and knowledge service. Key-Sun is one of founding members of AFNLP and ISO/TC37/SC4. He serves as the president of AFNLP (2009-2010), as the vice chair for ISO/TC37, and the secretary of SC4 for language resource management. He was an associate editor of ACM TALIP (2002-2006), and now of IJCPOL and IEICE Trans. Information and Systems. He was a PC co-chair of ISWC2007, organizing chair of GWC2006, conference chair of IJCNLP2005, and reviewer for numerous professional journals and conferences. He has received several awards: KAIST Grand Research Award (1998), FIPA Contribution Award (2000), Award from Ministry of Industry for International Standardization (2006), and international collaboration award of KAIST (2009). He is now a council member of AAMT, IAMT for machine translation; vice president of Infoterm and TermNet for international terminology association; and the president of Eafterm (East-Asia Terminology Association). Learn more. Hao-Hua Chu is a computer scientist. He is currently a professor in the department of computer science and information engineering at National Taiwan University. He received a Ph.D. degree in computer science in 1999 from the University of Illinois at Urbana-Champaign. His research interests are in ubiquitous computing, persuasive computing, and sensor networks. In particular, he is interested in creating digital technology that can engage and excite people into active participation in desirable physical and mental activities that are considered healthy, creative, productive, educational, and playful, with the goal of developing digital technology that empowers people in addition to supporting smart environments. He is currently leading the UbiComp lab at National Taiwan University. Learn more. Chenzhou Cui is project manager of the Chinese Virtual Observatory project. Dr. Cui holds the first Ph.D. degree in the world in Virtual Observatory. He is leading the design and development of the scientific database system for the LAMOST telescope–a special spectroscopic sky survey telescope with a 4-meter aperture and 4,000 fibers. He is also leading the development of a nationwide astronomical data center in China. Learn more. David Culler is a professor and chair of Computer Science at the University of California, Berkeley, associate chair of Electrical Engineering and Computer Sciences, and CTO of Arch Rock Corporation. Professor Culler received his B.A. from U.C. Berkeley in 1980, and his M.S. and Ph.D. from MIT in 1985 and 1989. He has been on the faculty at Berkeley since 1989, where he holds the Howard Friesen Chair. He is a member of the National Academy of Engineering, an ACM Fellow, an IEEE Fellow, and was selected for ACMs Sigmod Outstanding Achievement Award, Scientific American’s “Top 50 Researchers,” and Technology Review’s “10 Technologies that Will Change the World.” He received the NSF Presidential Young Investigators award in 1990 and the NSF Presidential Faculty Fellowship in 1992. He co-chairs the IETF working group on Routing on Low-Power and Lossy networks (ROLL). He was the principal investigator of the DARPA Network Embedded Systems Technology project that created the open platform for wireless sensor networks based on TinyOS, and was the founding director of Intel Research, Berkeley. He has done seminal work on networks of small embedded wireless devices, planetary-scale Internet services, parallel computer architecture, parallel programming languages, and high performance communication–including RPL, TinyOS, Berkeley Motes, PlanetLab, Networks of Workstations (NOW), and Active Messages. He has served on Technical Advisory Boards for several companies, including Inktomi, ExpertCity (now CITRIX on-line), DoCoMo USA, and People Power. Learn more. Sadaoki Furui received B.S., M.S., and Ph.D. degrees from Tokyo University in 1968, 1970, and 1978. After joining the Nippon Telegraph and Telephone Corporation (NTT) Labs in 1970, he worked on speech analysis, speech recognition, speaker recognition, speech synthesis, speech perception, and multimodal human-computer interaction. From 1978 to 1979, he was a visiting researcher at AT&T Bell Laboratories, Murray Hill, New Jersey. He was a Research Fellow and the Director of Furui Research Laboratory at NTT Labs and is currently a professor at the Department of Computer Science, Tokyo Institute of Technology. He has authored or coauthored more than 900 published papers and books, including Digital Speech Processing, Synthesis and Recognition. He has received the Paper Award and the Achievement Award from the Institute of Electronics, Information and Communication Engineers of Japan (IEICE) (1975, 1988, 1993, 2003, 2003, 2008), and the Paper Award from the Acoustical Society of Japan (ASJ) (1985, 1987). He has received the Senior Award and Society Award from the IEEE SP Society (1989, 2006), the International Speech Communication Association (ISCA) Medal for Scientific Achievement (2009), and the IEEE James L. Flanagan Speech and Audio Processing Award (2010). He has also received the Achievement Award from the Minister of Science and Technology and the Minister of Education, Japan (1989, 2006), and the Purple Ribbon Medal from the Japanese Emperor (2006). Learn more. Dr. Masataka Goto is the leader of the Media Interaction Group at the National Institute of Advanced Industrial Science and Technology (AIST), Japan. In 1992, he was one of the first to start work on automatic music understanding, and he has since been at the forefront of research in music technologies and music interfaces based on those technologies. In 1998 he received a Doctor of Engineering degree in electronics, information, and communication engineering from Waseda University, Japan. He then joined the Electrotechnical Laboratory (ETL), which was reorganized as the AIST in 2001. He has also worked on speech recognition interfaces such as Speech Completion and PodCastle (Speech Recognition Research 2.0). He serves concurrently as a visiting professor in the Department of Statistical Modeling at the Institute of Statistical Mathematics, an associate professor (Cooperative Graduate School Program) in the Department of Intelligent Interaction Technologies at the Graduate School of Systems and Information Engineering, University of Tsukuba, and a project manager of the MITOH Program (the Exploratory IT Human Resources Project) Youth Division by the Information Technology Promotion Agency (IPA). He has published more than 160 papers in refereed journals and international conferences. Over the past 18 years, he has received 25 awards, including the Young Scientists’ Prize; the Commendation for Science and Technology by the Minister of Education, Culture, Sports, Science and Technology; the Excellence Award in Fundamental Science of the DoCoMo Mobile Science Awards; the Best Paper Award of the Information Processing Society of Japan (IPSJ); and the IPSJ Nagao Special Researcher Award. He has served as a committee member for more than 60 scientific societies and conferences, and he was the general chair of the 10th International Society for Music Information Retrieval Conference (ISMIR 2009) and the chair of the IPSJ Special Interest Group on Music and Computer (SIGMUS). Learn more. Dr. Baining Guo is assistant managing director of Microsoft Research Asia, where he also serves as head of the graphics research lab. Prior to joining Microsoft, Dr. Guo was a senior staff researcher with the Microcomputer Research Labs of Intel Corporation, in Santa Clara, California. An IEEE Fellow, Dr. Guo has published extensively in the modeling and rendering areas of computer graphics and visualization, focusing on topics such as texture and appearance modeling, real-time rendering, and geometric modeling. He is currently an associate editor-in-chief of IEEE Transactions on Visualization and Computer Graphics. He is also on the editorial boards of Computer and Graphics and IEEE Computer Graphics and Applications. He has served as a member of international program committees for many major graphics conferences, including ACM Siggraph, IEEE Visualization, Eurographics Symposium on Rendering, Pacific Graphics, ACM Symposium on Virtual Reality Software and Technology, and ACM Symposium on Solid and Physical Modeling. He holds more than 40 granted or pending U.S. patents. Dr. Guo earned a B.S. degree from Peking University, and M.S. and Ph.D.degrees from Cornell University. Learn more. Mounir Hamdi received a B.S. degree in electrical engineering (computer engineering option with distinction) from the University of Louisiana in 1985, and he earned his M.S. and Ph.D. degrees in electrical engineering from the University of Pittsburgh in 1987 and 1991. From 1985 to 1991, he was a teaching/research fellow in the Department of Electrical Engineering, University of Pittsburgh, where he was involved in major research projects and taught undergraduate courses. Dr. Hamdi has been a faculty member in the Department of Computer Science and Engineering at the Hong Kong University of Science and Technology since 1991; he is now head and chair professor of computer science and engineering. He spent nine years as the director of the Computer Engineering Program, which has about 350 undergraduate students, and for three years he was the director of the Master of Science in Information Technology Program, which has about 150 post-graduate students. He is currently director of the Computer Engineering Lab. In 1999 and 2000 he held visiting professor positions at Stanford University and the Swiss Federal Institute of Technology in Lausanne, Switzerland. His general areas of research are high-speed packet switches/routers, optical networks, and wireless LANs. He has published more than 260 research publications, received numerous research grants, and supervised some 30 postgraduate students. Dr. Hamdi is currently working on high-speed networks, including the design, analysis, scheduling, and management of high-speed switches/routers, wavelength division multiplexing (WDM) networks/switches, and wireless networks. In particular, he is leading a research team at the Hong Kong University of Science and Technology that is designing one of the highest capacity chip sets for Terabit switches/routers in the world. This chip set is targeted toward 256 x 256 OC-192 Internet switches and includes a crossbar fabric chip, a scheduler/arbiter chip, and a traffic management chip. In addition, he is involved in designing network algorithms for 802.11 WLANs that are achieving significant improvement as compared to commercial products. Learn more. As corporate vice president of the External Research Division of Microsoft Research, Tony Hey is responsible for the worldwide external research and technical computing strategy across Microsoft Corporation. He leads the company’s efforts to build long-term public-private partnerships with global scientific and engineering communities, spanning broad reach and in-depth engagements with academic and research institutions, related government agencies, and industry partners. His responsibilities also include working with internal Microsoft groups to build future technologies and products that will transform computing for scientific and engineering research. Hey also oversees Microsoft Research’s efforts to enhance the quality of higher education around the world. Dr. Hsiao-Wuen Hon is the managing director of Microsoft Research Asia (MSRA), located in Beijing, China. Founded in 1998, MSRA has since become one of the best research centers in the world, called “the hottest computer science research lab in the world” MIT’s Technology Review. Dr. Hon oversees the lab’s research activities and collaborations with academia in the Asia Pacific region. An IEEE fellow and a distinguished scientist at Microsoft, Dr. Hon is an internationally recognized expert in speech technology. He serves on the editorial board of the international journal, Communications of the ACM. Dr. Hon has published more than 100 technical papers in international journals and at conferences. He co-authored a book, Spoken Language Processing, which is a graduate-level textbook and reference book in the area of speech technology in many universities all over the world. Dr. Hon holds three dozen patents in several technical areas. Dr. Hon has been with Microsoft since 1995. He joined Microsoft Research Asia in 2004 as a deputy managing director, responsible for research in Internet search, speech and natural language, system, wireless, and networking. In addition, he founded and managed search technology center (STC) from 2005 to 2007, the Microsoft Internet search product (Bing) development in the Asia-Pacific region. Prior to joining MSRA, Dr. Hon was the founding member and architect in Natural Interactive Services Division at Microsoft Corporation. Besides overseeing all architectural and technical aspects of the award winning Microsoft Speech Server product (Frost & Sullivan’s 2005 Enterprise Infrastructure Product of the Year Award, Speech Technology magazine’s 2004 Most Innovative Solutions Awards, and VSLive! 2004 Editors Choice Award), Natural User Interface Platform, and Microsoft Assistance Platform, he is also responsible for managing and delivering statistical learning technologies and advanced search. Dr. Hon joined Microsoft Research as a senior researcher at 1995 and has been a key contributor of Microsoft’s SAPI and speech engine technologies. He previously worked at Apple Computer, where he led research and development for Apple’s’ Chinese Dictation Kit. Dr. Hon received a Ph.D. degree in computer science from Carnegie Mellon University and a B.S. degree in electrical engineering from National Taiwan University. Learn more. Hopcroft earned his B.S. degree in electrical engineering from Seattle University in 1961 and his Ph.D. degree in electrical engineering from Stanford University in 1964. He has honorary degrees from Seattle University, the National College of Ireland, the University of Sydney, and St. Petersburg State University. He is an honorary professor of the Beijing Institute of Technology, Yunnan University, and an Einstein Professor of the Chinese Academy of Sciences. His current research interests are in the area of information capture and access. Hopcroft has served on numerous advisory boards, including the Air Force Science Advisory Board, the NASA Space Sciences Board, and the National Research Council’s Board on Computer Science and Telecommunications. In 1986 he was awarded the Turing Award by the Association for Computing Machinery, and in 1992, President H. W. Bush appointed him to the National Science Board, which oversees the National Science Foundation. He is a member of the National Academy of Engineering, the National Academy of Science, and the American Academy of Arts and Sciences. He is a Fellow of the Association for Computing Machinery, the Institute of Electrical and Electronics Engineering, and the American Association for the Advancement of Science. Hopcroft serves on the Packard Foundation’s Science Advisory Board, the Microsoft Technical Advisory Board for Research Asia, and the advisory boards of IIIT Delhi and the College of Engineering at Seattle University. He has received numerous awards: the IEEE Harry Goode Memorial Award in 2005, the CRA Distinguished Service Award in 2007, the ACM Karl V. Karlstrom Outstanding Educator Award in 2009, and the IEEE von Neumann Medal in 2010. Learn more. Dr. Jinpeng Huai currently works as chief scientist of Information Technology Steering Committee of the National High-Tech Program (863) during the Eleventh Five-Year Plan, member of the Advisory Committee for the State Information, and vice director of China Computer Federation. He has been awarded the National Science Fund for Outstanding Youth. He made the proposal to the World Wide Web Consortium (W3C) for hosting its China office in Beihang University. Under the patronage and organization of National Natural Science Foundation of China and National Science Foundation of the United States, he originated and organized the US-China Computer Science Leadership Summit to boost the training of scientific persons with ability and science & research cooperation. He served as the chair and the program chair of many notable conferences, including IEEE, SRDS2007, WWW2008, and ICWS2008, and has given more than 20 keynote speeches in academic conferences at home and abroad. Presently, he is mainly engaged in exploring computer software and theory, as well as Internet software technologies and system. His main creative contribution is the Security Protocol Model and Algorithm, Software Developing Method, and Trustworthy Service Middleware. Seung-won Hwang is assistant professor from Information and Database Systems Lab in the Department of Computer Science and Engineering at Pohang University of Science and Technology (POSTECH). Prior to joining POSTECH in 2005, she received her M.S. and Ph.D. degrees in computer science from University of Illinois at Urbana-Champaign. Her research interests lie in databases. Dr. Hwang has been published in major international journals and conferences, including ACM TODS, IEEE TKDE, SIGMOD, SIGKDD, and ICDE. Learn more. James Landay is the Short-Dooley Career Development Professor in Computer Science and Engineering at the University of Washington, where he specializes in human-computer interaction (HCI). He is spending his 2009-2010 sabbatical at Microsoft Research Asia in Beijing, where he is helping lead the HCI group’s research agenda. From 2003 through 2006, he was also the laboratory director of Intel Labs Seattle, a university-affiliated research lab exploring ubiquitous computing. His current research interests include automated usability evaluation, demonstrational interfaces, mobile and ubiquitous computing, user interface design tools, and web design. Dr. Landay received his B.S. degree in electrical engineering and computer science from the University of California at Berkeley in 1990 and his M.S. and Ph.D. degrees in computer science from Carnegie Mellon University in 1993 and 1996. His doctoral dissertation was the first to demonstrate the use of sketching in user interface design tools. He was also the chief scientist and cofounder of NetRaker. In 1997, Dr. Landay joined the faculty in electrical engineering and computer science at the University of California at Berkeley, leaving as an associate professor in 2003. Learn more. Weiping Li received his B.S. degree in electrical engineering from the University of Science and Technology of China (USTC) in 1982 and his M.S. and Ph.D. degrees in electrical engineering from Stanford University in 1983 and 1988. In 1987, he joined the faculty of Lehigh University as an assistant professor in the Department of Electrical Engineering and Computer Science. In 1993, he was promoted to associate professor with tenure. In 1998, he was promoted to full professor. From 1998 to 2000, Dr. Li was director of research and development at Optivision, Inc., and from 2000 to 2002, he was CEO of WebCast Technologies, Inc. Since 2002, he has been with Bada Networks, Inc. (formerly Amity Systems, Inc.), where he is currently vice president and chief technology officer. He was also the founding general manager of Yo-Lian Interactive Multimedia Communication Science and Technology (Beijing) Inc. from 2006 to 2008. In March of 2010, he was appointed to the position of the dean for the School of Information Science and Technology at USTC. In August of 2010, he was appointed to the position of president representative for North America Affairs at USTC. In the field of multimedia communication, Dr. Li has made many academic contributions. He has been elected to fellow of IEEE for contributions to image and video coding algorithms, standards, and implementations. He served as the editor-in-chief of IEEE Transactions on Circuits and Systems for Video Technology. He served as a guest editor for a special issue of IEEE Proceedings. He served as the chair of several technical committees in IEEE Circuits and Systems Society and IEEE International Conferences. He served as the chair of Best Student Paper Award Committee for SPIE Visual Communications and Image Processing Conference. Dr. Li has also made many contributions to international standards. His inventions on Fine Granularity Scalable Video Coding and Shape Adaptive Wavelet Coding have been included in the MPEG-4 International Standard. According to Google Scholar, his March 2001 paper “Overview of Fine Granularity Scalability in MPEG-4 Video Standard,” published on IEEE Transactions on Circuits and Systems for Video Technology, had been cited by other publications more than 800 times as of April 2010. He served as a member of the Moving Picture Experts Group(MPEG) of the International Standard Organization (ISO) and as an editor of MPEG-4 International Standard. He served as a founding member of the Board of Directors of the MPEG-4 Industry Forum. As a technical advisor, he also made contributions to the Chinese Audio Video Coding Standard (AVS) and its applications. Weiping Li received a certificate of appreciation from ISO/IEC as project editor in development of International Standard in 2004. He received certificates of appreciation from IEEE for services as editor-in-chief in 2001, workshop chair in 2000, technical committee chair in 1999, associate editor in 1999, and conference track chair in 1997. He was aslo the co-recipient with Dr. Ya-Qin Zhang of the Best Paper Award from the International Conference on Neural Networks and Signal Processing in 1995. He received the Spira Award for Excellence in Teaching in 1992 at Lehigh University and the first Guo Mo-Ruo Prize for Outstanding Student in 1980 at University of Science and Technology of China. Chin-Yew Lin is a senior researcher at Microsoft Research Asia, where he manages the Web Intelligence (WIT) group. His research interests are text and data mining, user intent understanding and task completion, and social computing. He is developing a scalable automatic question answering and distillation system, known as SQuAD. The goal is to enable personalized, socially aware, rich-client plus cloud computing applications powered by intelligent data services. He is the area chair of Question Answering and Textual Entailment of ACL 2010. He has been published regularly in major natural language processing and information retrieval conferences. Learn more. Dr. Xiaoning Ling is currently CEO of X-Gainian Foundation, an education venture capital firm that specializes in improving software education and development by facilitating global innovative concepts and ventures through new programs at higher education institutions. Dr. Ling was a professor of the software college at Hunan University in China from 2006 to 2010 and a guest professor and department chair at Beijing University from 2002 to 2006. From 1993 to 2006, he was employed by Microsoft as a software architect, development manager, program manager, and software development engineer. He developed portions of Microsoft products, including Visual Studio, SQL Server, Visual InterDev, and Access, and he was also awarded a few U.S. patents on graphics, multimedia, and systems. Dr. Ling obtained his Ph.D. degree from Ohio State University and his M.S. and B.S. degrees from Beijing University. He has been honored with many national and regional awards for innovative curriculums in college software education. Dr. Jimmy Liu graduated from the University of Science and Technology, China, and the School of Computing, National University of Singapore. During the past 22 years, he has held technical development and management positions with Singapore government-linked companies and multi-national corporations, as well as Singapore local enterprises. During the past six years, Jimmy focused his research on medical imaging. He heads the Feature and Segmentation Group and Intelligent Medical Imaging Group (iMED) in I2R, A*Star. Jimmy is working on MRI, CT, retina medical image processing, and medical image-based Computer Assisted Diagnosis (CAD)/Computer Aided Surgery (CAS). He is the adjunct research scientist in Singapore National Eye Research Institute in Singapore General Hospital, and supervises Ph.D. students from the National University of Singapore and Nanyang Technology University of Singapore. Learn more. Dr. Wei-Ying Ma is an assistant managing director at Microsoft Research Asia, where he oversees multiple research groups including Web Search and Data Mining, Natural Language Computing, and Human Computer Interaction. Over the years, under his leadership, Wei-Ying’s team of researchers have been recognized as one of the global powerhouses in search, data mining, and multimedia information retrieval related research. The team transferred key technologies into Microsoft’s search and online service products. In addition, they published extensively at major conferences such as the SIGIR, WWW, and ACM Multimedia. Before joining Microsoft in 2001, Wei-Ying was with HP Labs in Palo Alto, California, where he worked in the fields of multimedia adaptation and distributed media services infrastructure. From 1994 to 1997, Wei-Ying was engaged in the Alexandria Digital Library project at the University of California, Santa Barbara. During this time, he developed one of the first web-based image-retrieval systems, Netra, which is regarded as one of the most influential image retrieval systems. As an active member of the research community, Wei-Ying has published more than 250 papers at international conferences. He currently serves on the editorial boards of ACM Transactions on Information System (TOIS) and ACM/Springer Multimedia Systems Journal. In recent years, he served as program co-chair of WWW 2008, program co-chair of PCM 2007, general co-chair of AIRS 2008, and general co-chair of MMM 2005. Wei-Ying earned a bachelor of science degree in electrical engineering from the National Tsing Hua University in Taiwan in 1990, and a master of science degree and doctorate in electrical and computer engineering from the University of California at Santa Barbara in 1994 and 1997, respectively. Learn more. HyunWook Park is a professor of the department of electrical engineering at the Korea Advanced Institute of Science and Technology (KAIST). He has been the department head of electrical engineering at KAIST since 2005. In 1981, he received his B.S. degree in electrical engineering from Seoul National University, Seoul, Korea, and in 1983 and 1988 he received his M.S. and Ph.D. degrees in electrical engineering from Korea Advanced Institute of Science and Technology KAIST. He has been a professor in the electrical engineering department since 1993 and an adjunct professor in the bio and brain engineering department since 2003. He was a research associate at the University of Washington from 1989 to 1992 and was a senior executive researcher at the Samsung Electronics Co. Ltd., from 1992 to 1993. Dr. Park is a senior member of IEEE. He has served as associate editor for the International Journal of Imaging Systems and Technology. His current research interests include image computing system, image compression, and medical imaging systems. Learn more. Rashid received master of science (1977) and doctoral (1980) degrees in computer science from the University of Rochester. He graduated with honors in mathematics and comparative literature from Stanford University in 1974. Learn more. Dr. Guobin (Jacky) Shen joined Microsoft Research Asia in January 2001, where he is now a lead researcher in the Wireless and Networking Group. His research interests include mobile computing and systems, peer-to-peer systems and networking, wireless sensor networks, video compression, and streaming. He received his Ph.D. from the Hong Kong University of Science and Technology (HKUST) in 2001, M.S. degree from Southeast University in 1997, and B.S. degree from Harbin University of Engineering in 1994, all in electrical and electronic engineering. He has published approximately 50 technical papers, including journal papers and top conferences in respective fields he worked in. He won 3 Best Demos at SenSys ’07 and MobiSys ’07, ’08. He has been granted two U.S. patents for his Ph.D. work and four after joining Microsoft, and has filed nearly 30 patents. He is a senior member of IEEE and a member of ACM. Currently, he serves on the Multimedia System and Applications Technical Committee of the IEEE Circuits and Systems Society. He is also an associate editor to several journals, a TPC member for many international conferences, and a reviewer for many journals and many conferences. Ms. Lolan Song is a senior director at Microsoft Research Asia responsible for academic collaboration in the Asia-Pacific region. As Microsoft’s fundamental research arm in the Asia-Pacific region, building long-term and mutually beneficial relations with academia is vital to Microsoft Research Asia. Lolan Song leads a regional team with members based in Australia, China, Japan, Korea, and Taiwan, which engages universities, research institutes, and certain relevant government agencies. She establishes strategies and directions, identifies business opportunities, designs various programs and projects, and manages a multi-million dollar budget and operation. Her team works with students, researchers, faculty members, and university administrators to build strong partnerships and also works closely with the groups at Microsoft Research Asia. Lolan Song joined Microsoft in Redmond, Washington, in 1994 as a systems engineer. She worked in Tokyo for more than five years and in Redmond for five years before she moved to Beijing, China, in 2004. Prior to her current role, Lolan Song worked in various positions at Microsoft ranging from systems engineer for business applications, IT manager for the Asia-Pacific region, senior program manager for a large-scale data mining system, to the business manager for a global technical online community program. Before joining Microsoft, Lolan Song worked on software development for small, start-up companies and large companies. Frank Soong is a principal researcher and research manager of the Speech Group. He received his B.S., M.S., and Ph.D., all in EE, from the National Taiwan University, the University of Rhode Island, and Stanford University, respectively. He joined Bell Labs Research, Murray Hill, NJ, United States, in 1982, worked there for 20 years and retired as a Distinguished Member of Technical Staff in 2001. At Bell Labs, he worked on various aspects of acoustics and speech processing, including speech coding, speech and speaker recognition, stochastic modeling of speech signals, efficient search algorithms, discriminative training, dereverberation of audio and speech signals, microphone array processing, acoustic echo cancellation, and hands-free noisy speech recognition. He was also responsible for transferring recognition technology from research to AT&T voice-activated cell phones, which were rated by the Mobile Office Magazine as the best among competing products evaluated. He was the co-recipient of the Bell Labs President Gold Award for developing the Bell Labs Automatic Speech Recognition (BLASR) software package. He visited Japan twice as a visiting researcher: first from 1987 to 1988, to the NTT Electro-Communication Labs, Musashino, Tokyo; then from 2002 to 2004, to the Spoken Language Translation Labs, ATR, Kyoto. In 2004, he joined Microsoft Research Asia (MSRA), Beijing, China, to lead the Speech Research Group. He is a visiting professor of the Chinese University of Hong Kong (CUHK) and the co-director of CUHK-MSRA Joint Research Lab, recently promoted to a National Key Lab of Ministry of Education, China. He was the co-chair of the 1991 IEEE International Arden House Speech Recognition Workshop. He has served the IEEE Speech and Language Processing Technical Committee of the Signal Processing Society, as a committee member and associate editor of the Transactions of Speech and Audio Processing. He published extensively and coauthored more than 200 technical papers in the speech and signal processing fields. Learn more. Jian Sun was born in Xian (home of Terracotta Army), China, in October 1976. He received a B.S. degree, an M.S. degree, and a Ph.D degree from Xian Jiaotong University in 1997, 2000, and 2003. He joined Microsoft Research Asia in 2003. His research is in the fields of computer vision and computer graphics, with particular interests in interactive compute vision (user interface plus vision) and Internet compute vision (large image collection plus vision). He is also interested in stereo matching, computational photography, and face recognition. Stewart Tansley is a senior research program manager responsible for devices in Natural User Interactions in External Research at Microsoft Research. Before joining Microsoft in 2001, he spent 13 years in the telecommunications industry in software research and development, focusing on technology transfer. He has a Ph.D. degree in artificial intelligence (AI) applied to engineering from Loughborough University, United Kingdom. He has published a variety of papers on robotics, artificial intelligence, and network management; holds several patents; and has co-authored a book on software engineering for AI applications. In 2009 he co-edited The Fourth Paradigm, a book collating visionary essays on the emerging field of data-intensive science. Chuck Thacker joined Microsoft in 1997 as director of Advanced Systems to assist in the establishment of the Microsoft Cambridge Research Lab, where he was involved in recruiting, defining the research agenda, publicity, and establishing the lab’s operating procedures. At the end of this two-year assignment, he returned to the United States and worked on the first Tablet PC. In 2005, he returned to Microsoft Research, where he is building a group to engage in computer architecture research at the Microsoft Silicon Valley campus. Before joining Microsoft, Thacker worked for the Xerox Palo Alto Research Center (PARC), and later at the Digital Equipment Systems Research Center. He served as project leader of the MAXC timesharing system, and as the chief designer on Alto, the first personal computer to use a bit-mapped display and mouse for user interface. Thacker is also the co-inventor of the Ethernet local area network, the DEC Firefly multiprocessor workstation, and the AN1 and AN2 networks. He has published widely and holds numerous patents in the areas of computer architecture and networking, and has led a number of seminal projects in these areas. Thacker was awarded an honorary doctorate from the Swiss Federal Institute of Technology, and is a distinguished alumnus of the Computer Science Department at the University of California. He is a member of the IEEE, a fellow of the ACM, a Member of the American Association of Arts and Sciences, and a member of the National Academy of Engineering, which in 2004 awarded him the Charles Stark Draper Prize (with A. Kay, B. Lampson, and R. Taylor) for the development of the first networked distributed personal computer system. In 2007, Thacker received the IEEE’s John Von Neumann medal, which is awarded for outstanding achievements in computer-related science and technology, for his central role in the creation of the personal computer and the development of networked computer systems. Also in 2007, Thacker was given an award from the Computer History Museum for his work on the Alto and “innovations in networked personal computer systems and laser printing technologies.” Learn more. His research interests include ubiquitous computing systems, smart spaces, sensor networks, distributed real-time operating systems, and embedded systems. He has created many distributed real-time operating systems and software tools such as Real-Time Mach, the ARTS Kernel, Shoshin, Scheduler 1-2-3, and ARM (Advanced Real-Time Monitor). He also created many UbiComp platforms such as Smart Space Lab., Smart Furniture, uPhoto, uTexture and uPlatea. Because of his research and educational contributions, he was awarded the Motorola Foundation Award; the IBM Faculty Award; the Ministry of Economy, Trade and Industry Award; and the Ministry of Internal Affairs and Communication Award in Japan. He is a corresponding member of Science Council of Japan, IPSJ (Information Processing Society of Japan) Fellow and a member of the IEEE, ACM, IPSJ, IEICE. He was a general chair of UbiComp2005 in Tokyo and a co-general chair of Pervasive2009 in Nara. Learn more. Professor Junichi Tsujii is professor of Natural Language Processing in the Department of Computer Science, University of Tokyo. He is also scientific director of the National Centre for Text Mining (NaCTeM), and professor of Text Mining in the School of Computer Science University of Manchester. He has worked since 1973 in Natural Language Processing, Question Answering, Text Mining, and Machine Translation. He is project leader of specially promoted research on Advanced NLP and Text Mining, by the Ministry of Education, Culture, Sports, Science and Technology (MEXT) in Japan (2006-2011); and co-investigator of several projects supported by BBSRC in the United Kingdom. He has given keynote speeches and invited talks at many conferences, including LREC (2004), IWSL (2004), SMBM (2005), ICSB (2006), BioCreative(2007), and IEEE-ASRU(2007). His recent research achievements include (1) deep semantic parsing based on feature forest model, (2) efficient search algorithms for statistical parsing, (3) improvement of estimator for maximum entropy model, and (4) construction of the gold standard corpus (GENIA) for Bio Text Mining. He has received a number of awards, including the IBM Science Award (1989), SEYMF Visiting Professorship (2000), Daiwa-Adrian Prize (2004), IBM Faculty Award (2005), and Achievement Award of Japan Society for Artificial Intelligence (2008). He was president of ACL (Association for Computational Linguistics, 2006). He is a permanent member of ICCL (International Committee for Computational Linguistics, 1992-) and auditor of Research Organization of Information and Systems in Japan (2006-). He has authored more than 300 papers in journals, conferences, and books. Learn more. Catharine van Ingen is a partner software architect in the Microsoft Research eScience Group. Her research is focused on lowering the data entry barrier in the environmental sciences. One of her current projects is MODISAzure–a cloud service for computing water balance and carbon fixing across the continental United States by synthesizing TBs of satellite imagery, GBs of ground based sensor data, and KBs of direct field measurements. Catharine has a wealth of experience in hardware, including work with the Alpha machine and MIPS processor teams, industrial-strength software for algorithms used to manage water flows, logging data from particle accelerator detectors, and early Internet commerce software for purchasing Mickey Mouse watches. She holds a Ph.D. in civil engineering from Caltech. Curtis Wong is a principal researcher in the eScience group at Microsoft Research and works closely with Project vX. He joined Microsoft in 1998 to start the Next Media Research group focusing on interaction, media, and visualization technologies. He has more than 45 patents granted or pending in areas such as interactive television, media browsing, visualization, search, and gaming. He is also co-author of Microsoft’s five thousandth patent in 2006 and ten thousandth patent in 2009. Curtis is the co-creator of the WorldWide Telescope, featuring the largest collection of the highest resolution ground and space based imagery ever assembled into a single learning environment, inspiring millions of users around the world to explore and understand the Universe. His recent research work focuses on the challenge of interactive geospatial temporal data visualization. His most recent project is Project Tuva, featuring the highly regarded 1964 Messenger Series lectures of Nobel Prize winning physicist Richard Feynman within a unique interactive rich media player featuring rich interactive simulations and related content. Prior to Microsoft, Curtis was a director of the Content group at Intel Corporation, General Manager at Corbis Productions, and producer for the Voyager Company where he was responsible for Microsoft Multimedia Beethoven and Amanda Stories–two of the first ten multimedia CD-ROMs for Windows. Curtis serves on the board of the Seattle Art Museum, PBS Kids in Washington D.C. and previously on the boards of the Rhode Island School of Design, Ovation–The Arts Network, and has served as an advisor to the Corporation for Public Broadcasting, the Canadian Film Centre, American Film Institute, the J. Paul Getty Foundation, and the Barnes Foundation. Learn more. Enwei Xie is the general manager of Developer Platform Evangelism (DPE), responsible for Microsoft’s partnership with software companies and developers as well as university cooperation for next-generation software/IT talent throughout the greater China region. Microsoft has always depended on strong relationships with other software companies and developer groups. DPE aims to increase the availability of Microsoft tools and platforms and collect feedback to help Microsoft build software that serves the market better. DPE offers key partners/customers the opportunity to use Microsoft tools/platforms ahead of the market, and works with these partners to build an exciting industrial ecosystem. Prior to joining DPE, Enwei Xie was the general manager of Server and Tools Business China (STB China) of the Microsoft China R&D group. He was responsible for building a global multi-site development center in Shanghai that integrates with all STB product groups in Redmond and across the world, and is committed long-term to global engineering and multi-site development. Enwei has also served in leadership roles for various groups in the Developer and Windows Server divisions since he joined Microsoft in 1994. Enwei holds a B.A. in physics, mathematics, and computer science from the Luther College, Iowa, United States. Feng Zhao is an assistant managing director at Microsoft Research Asia, where he oversees multiple research areas, including hardware computing, software analytics, systems, and wireless and networking. His own research has focused on networked embedded systems such as sensor networks, energy and resource management of distributed systems as in data centers and cloud computing, and mobile devices and mobility. He has also done work on parallel computing, fast N-body algorithms, machine recognition, and diagnostics. Prior to working for Microsoft Research Asia, Dr. Zhao was a principal researcher at Microsoft Research Redmond, where he founded and managed the Networked Embedded Computing Group. The group has developed the MSR sensor mote, tiny Web Service, SenseWeb and SensorMap, Data Center Genome, JouleMeter, and GAMPS data compression. With the help of some of these technologies, the Microsoft data centers are now among the most densely instrumented and monitored cloud computing infrastructures in the world. Dr. Zhao received his Ph.D. degree in electrical engineering and computer science from MIT, has taught at Stanford University and Ohio State University, and currently also serves as an affiliate faculty of computer science and engineering at University of Washington and an adjunct professor at Hong Kong University of Science and Technology. He was a principal scientist at Xerox PARC and founded PARC’s research effort in sensor networks and distributed diagnostics. He serves as the founding editor-in-chief of ACM Transactions on Sensor Networks, and he has authored or co-authored more than 100 technical papers and books, including a book published by Morgan Kaufmann: Wireless Sensor Networks: An information processing approach. An IEEE Fellow and ACM Distinguished Engineer, Dr. Zhao received a Sloan Research Fellowship and NSF and ONR Young Investigator Awards. His work has been featured in news media such as BBC World News, BusinessWeek, and Technology Review. Xin Zou is a principal development manager at Microsoft Research Asia, Innovation Engineering Group. He works with his colleagues in technical innovation, and transferring research ideas into commercial products. He has been working at Microsoft Corporation since 1996, when he joined the Microsoft Office Outlook team as a developer. He had worked in Outlook, Microsoft internal tools, and Team Foundation Server of Visual Studio 2005. Prior to his Microsoft career, he worked on Unix software and on GPS/GIS applications, and did software testing in China and for U.S. companies. He also teaches Advanced Software Engineering at Tsinghua University and Peking University. He has published books about VSTS development and programming puzzles (in Chinese). In 1996, he received his M.S. C.S. degree from Wayne State University, Detroit, Michigan, and in 1991, he received his B.S.C.S. degree from Peking University, Beijing, China. When and where will the faculty summit be held? 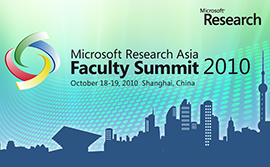 The Microsoft Research Asia Faculty Summit will be held October 18–19, 2010, at the Hyatt on the Bund Hotel and the Microsoft Zizhu Campus in Shanghai, China. Please submit your registration information through our online registration website. You will receive an email confirmation after successfully completing the registration. Should you have any further questions about the summit and logistics, please contact our faculty summit service team at confirmation@etgchina.com. What is the basic conference schedule? What does Microsoft pay for? What is not covered? Microsoft will host sponsored Faculty Summit participants during the conference dates, October 18 and 19, 2010, to include Microsoft direct-paid economy class round-trip air ticket, program meals, program events, and hotel accommodations. Any item purchased directly by the participant is the responsibility of the participant. If traveling with a spouse/companion, all travel expenses for the spouse/companion will be the responsibility of the participant and are not covered by Microsoft. Other costs incurred at the hotel—such as phone, fax, Internet, mini bar, and laundry—will not be covered by Microsoft. How do I get to the hotel from the airport and how long does it take? We recommend you take a taxi from the airport. Is transportation provided for the conference? Transportation will be provided from the hotel to the event venue, dinner venues, and Computing in the 21st Century Conference. Microsoft will not provide ground transportation from airports to the event hotel. We recommend you take a taxi from the airport or the train station. Please dress casually and comfortably. You do not have to wear a coat or tie. Autumn (September to November) is one of the best times of the year for visiting Shanghai. The weather is generally sunny and quite pleasant. Since there is much rain during that period, it is advisable to bring an umbrella or light rain wear. How can I be reached at the hotel? A meal coupon for a buffet dinner will be provided at the Hyatt on the Bund hotel for dining on Sunday, October 17, from 18:00 until 21:00. Breakfast, lunch, and dinner are served on October 18 and 19. Please note that Microsoft cannot reimburse you for any meals that you purchase directly. You are asked if you have any dietary requirements or food allergies during the registration process. May I use my phone during the conference? We ask that you set your pager or cellular phone to silent or vibrate during the conference presentations. If you need to leave the presentation room, please do so with a minimum of disruption to other participants. The agenda has been arranged with morning and afternoon breaks for email and phone access. Is smoking permitted in the conference venue? Smoking is not permitted in the conference venue. Smoking is permitted in designated areas.